Rain and walking—brought in a little suffering to make it really feel like a pilgrimage. Umbrellas popped up as we got off the bus at the Chapel of the Ascension where the feet of Jesus left the earth to ascend into the cloud. Why a cloud? Because a cloud represents the glory of God and Jesus was returning back to the glory of heaven. Also because Daniel talked about this in Daniel 7:13-14. 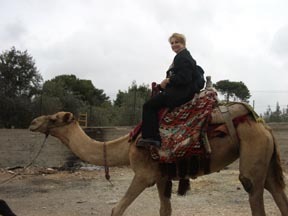 We then walked a few yards to the Mount of Olives Bazaar where every one did their last shopping—but mostly where everyone got to ride the camel. Fun and pictures were had by all. Since it was raining pretty hard we drove the bus down the Mount of Olives to Gethsemane. We saw the 2,000 year old olive trees in the Garden and prayed in the Church of All Nations which is also called the Church of the Agony. It was here that Jesus took upon himself the weight of the sins of the world. There was a Mass in the Grotto of the Arrest so we descended into the Tomb of Mary next door. Mary fell asleep in the Dormitian, was buried in this tomb and was later assumed into heaven. No city or church has ever claimed to have the bones of Mary as they do with all the other saints. We then prayed at the Western Wall inside the Dung Gate and then lunch at the Notre Dame Center. WE had an extra hour before we could gain entrance to the Church of St. Ann for Mass so we toured the very-well-done Shroud Exhibit at the Notre Dame. St. Ann’s Church is just inside St. Stephen’s Gate in the Old City and it is build in front of the Pools of Bethesda (John 5) and right over the grotto where Mary was born. We sang here because the acoustics are marvelous—“Immaculate Mary, your praises we sing!” We had Mass inside the monastery since the church was so full and we were on a tight schedule. I gave a short history and biblical talk about the Pools of Bethsaida. We then began the Stations of the Cross—the Way of Sorrows—the Via Dolorosa. 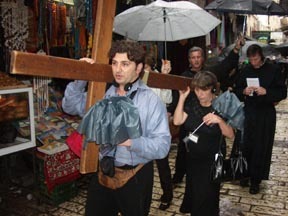 We carried the cross through the crowded, noisy and rainy streets following the way of Our Lord. This is always a highpoint of the pilgrimage, especially as we recall the Passion of the Christ by Mel Gibson. 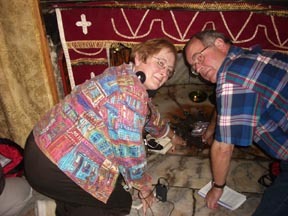 We entered the Church of the Holy Sepulchre which was packed with people from all over the world. I had to be a bit pushy and act as a demanding shepherd to get our group into line and protect the line so that our pilgrims had time to visit and pray inside the tomb. People always ttry to cut in front of get their groups in first. The Latin Catholics (Franciscans) had their processions and prayers followed by the Armenian seminarians. Beautiful singing and wonderful experience. Everyone entered the tomb and then we went to an authentic Arabic dinner and the Philadelphia where US presidents have eaten in the past. After this the pilgrims packed and left for the airport.. They were exhausted, but this was a wonderful pilgrimage that we pray will effect their lives helping them to understand and defend their faith and to bring them to sainthood. 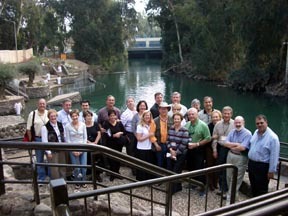 Our first day on the ground in Jerusalem. It is quiet here—peaceful and friendly. No one ever saw anything to alarm them or to even hint at troubles. Everyone commented over and over again that what they saw here is NOT what they see on the sensationalist news media. We started the day with Mass on Calvary—imagine that! 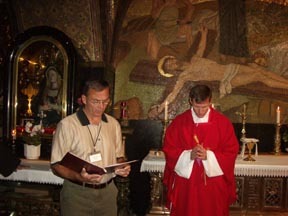 Mass at the very geographical location where Jesus was stripped of his clothes, nailed to the cross and raised up to experience the most gruesome form of execution ever devised. Many people wept, including Fr. Gerald as he struggled through the Mass. It was moving and life changing for pilgrims. After breakfast at Notre Dame Center we drove through the check point into the Palestinian town of Bethlehem. It too was very quiet, friendly and peaceful. We shopped at the quality Christian shop called The Nissan Brothers. 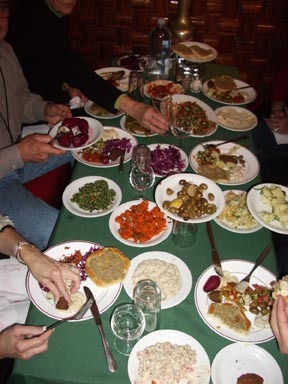 This shop and restaurant support 67 Christian families in Bethlehem. Christians are the persecuted minority and only make up 1-2% of the population. Next we visited Shepherd’s Field where the angels announce the birth of Jesus to the shepherds. Why shepherds? Because shepherds are always the first to know about the birth of a lamb. 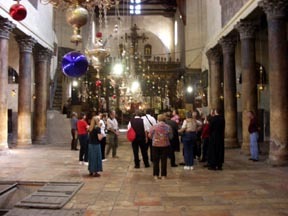 The Church of the Nativity where Jesus was born is always a highlight of any pilgrimage. To reach your hand through the 14 pointed star to touch the ground level in the cave of His birth is always toughing. We took pictures of everyone as they knelt at this spot. We also saw the tomb of St. Jerome and the Church of St. Catherine of Alexandria where the Christmas Mass is televised each Christmas. After lunch in Bethlehem we drove back to Jerusalem and visited Mount Zion. We started in the Church of the Dormition where Mary fell asleep. Here I did a short talk on the Assumption. 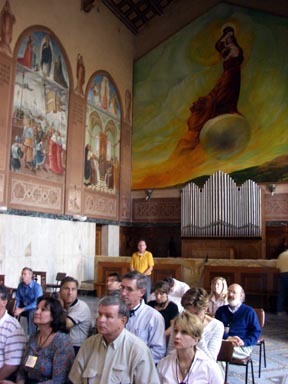 Then on to the Upper Room to discuss the institution of the priesthood, the Eucharist, the Sacrament of Reconciliation and the day of Pentecost. 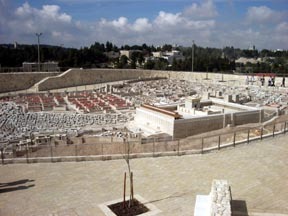 Right below is the Tomb of David. Down the hill we visited the Church of St. Peter in Gallicantu where Jesus was tried by the High Priest Caiaphas and where Peter denied Jesus three times. 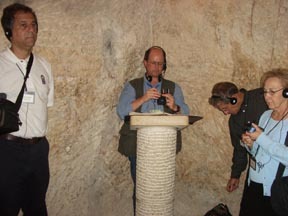 It was here that Jesus was imprisoned on Holy Thursday and we went into the deep prison and read Psalm 88. Everyone walked on the old Roman Steps which we know Jesus himself walked on. One of the very special events of this pilgrimage was the invitation from the Latin Patriarch Michel Sabbah to visit him in the Latin Patriarchate in the Old City. We were presented to the Patriarch . 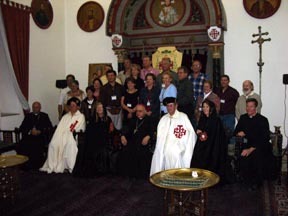 We had a couple with who are a Knight and Lady of the Equestrian Knights of the Holy Sepulchre. (Janet and I are also a Knight and a Lady, see picture.) This couple received their Shell from the Patriarch for having visited the Holy Land. 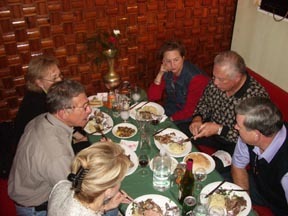 After dinner at the Inbal Hotel we had an animated discussion of the Israeli – Palestinian situation. I put up a map to explain the geography and then explained both sides: Israeli and Palestinian. A very lively discussion followed and everyone found it very helpful to understand better what they hear every day on the news. We crashed into bed exhausted. Tears in the eyes and uttered expressions of deep faith were our daily companions. The initial fear of entering Israel was soon replaced with calm and joy and enthusiasm. 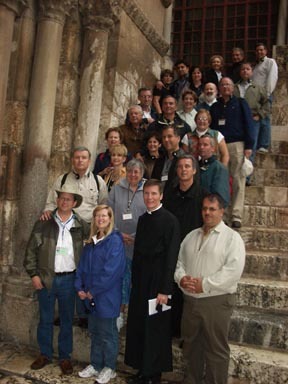 From our conversations and sharing along the way, it was overwhelmingly apparent that these pilgrims were deeply moved and these Legatus pilgrims had an experience of a lifetime. 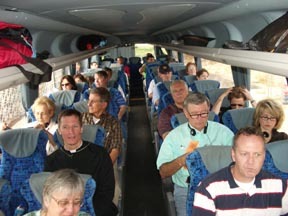 After a good breakfast at the Rimonim Hotel in Tiberias we boarded the bus for the long trip from Galilee south – to go UP to Jerusalem. Remember that no matter where you come from you always go UP to Jerusalem—even when you are coming from the north to Jerusalem. The phrase “up to Jerusalem” is used over 20 times in the Bible. 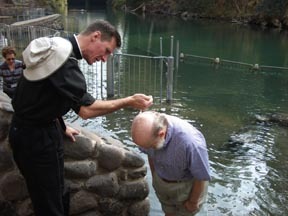 On the way we stopped along the Jordan River for everyone to renew their baptism in the Jordan River with little fish swimming around everyone’s ankles. We also made sure everyone took a bottle of Jordan River water with them. Fr. Gerald did a great job. Along the 2 hour drive there is a lot to see. We always drive through the Jordan Valley along the river. On our right is the Palestinian West Bank and on the left are the mountains of Jordan. It is hot and desert looking area but full of biblical history. We always see camels, sheep and Bedouin tribes, especially as we get closer to Jerusalem in the Judean Wilderness. We see the Dead Sea, Jericho, Bethany along the way. I always remind people to remember that the Holy Family walked all this way at least twice a year. They were a tough family!! Upon entering Jerusalem, we went to the Israel Museum where we spent time at the ½ acre Jerusalem Model—an exact replica of the city of Jerusalem during the time of Christ. We walked around and explained the history of the Bible as it pertained to the 2nd Temple Period city of Jerusalem. We then visited the Shrine of the Book which is devoted to the Dead Sea Scrolls. Lunch then on to the Promenade which is one of the best views of Jerusalem from a lookout point. I explained everything we would see and the places we would be walking over the next few days. Then on to Ein Kerem where Mary walked for many days to visit Elizabeth and where John the Baptist was born. Then we drove to the newly renovated and elegant Inbal Hotel. However, after several discussions, Legatus has agreed to use the Christian pilgrim center in the future—the Notre Dame Center.